In 2017, Michigan as team threw for 2,226 yards and 9 touchdowns with a 53.5% completion percentage. In his second year at Ole Miss, in only 7 games, Shea Patterson threw for 2,259 yards, 17 touchdowns and a 63.8% completion rate. I'm not going to say that I think Shea Patterson is going to the starter against Notre Dame on September 1st...he IS going to be the starter. All due respect to Brandon Peters, but what Michigan needs is a baller. Someone who can put the team on their back and has the guts and talent to make plays happen. I don't know for sure if Patterson is the guy, but he's the best option we have on the roster right now. I think Peters is the backup, Milton and McCaffrey are the future, and Patterson is the best option to make 2018 a success. No position on the team is more pivotal than the offensive line...especially this Michigan team which seems to be brimming with talent and potential at every offensive skill position. Michigan returns 3/5 of a unit that most would all agree underperformed last year. The left tackle position has been and will continue to be the achilies heel for this unit and the offense as a whole unless JBB can shore up that spot. Word is Grant Newsome is being seriously evaluated after his prolonged recovery from the catastrophic knee injury he sustained in 2016. While we LOVE the fact that Grant is back in the mix, I wouldn't get too excited just yet. If he can add depth as a serviceable backup, that may be the best we should hope for. Last year, the OL was a mess for much of the season as Michigan flipped between contrasting QB styles, multiple playcalling schemes and multiple offensive playcallers. Michigan's offense suffered from zero identity and the offensive line anchored those struggles. Enter new OL coach Ed Warinner. Warinner is a classic OL coach...having spent 16 of the last 20 years coaching just that unit most recently at Ohio State (2012-16) and Notre Dame (2010-11). Last year he was the running game coordinator at Minnesota. Harbaugh has sung Warinner's praises since he arrived in March and the two have been reported to be gelling quickly. Warinner has praised new strength coach Ben Herbert and the impact he's had on the OL's overall strength and conditioning in such a short amount of time. The mandate for Warinner is to take his strategy used in Columbus and bring it to Ann Arbor. Word on the street is that drastic changes have been made to the OL playbook in order to simplify what was an uber-complex scheme utilized by Tim Drevno. If the 4-headed offensive monster of Harbaugh-Hamilton-McElwain-Warinner can all be on the same page, which I think is a real possibility, then the sky could be the limit for 2018. But man does that LT spot make me nervous. For the first time in a long time, Michigan has a shot at a real legit 1000-yard rusher this season. Not since Fitz Toussaint in 2011 (1,041 yards) has a Michigan running back eclipsed 1K yards in a single season. Karan Higdon was just 6 yards short of that last year. Before Toussaint, 1000 yard rushers were common in Ann Arbor...Wheatley, Biakabutuka, Perry, Hart...Michigan was a breading ground for running backs. It's almost like for Michigan to really feel like Michigan again, they need to develop and execute a potent rushing attack. 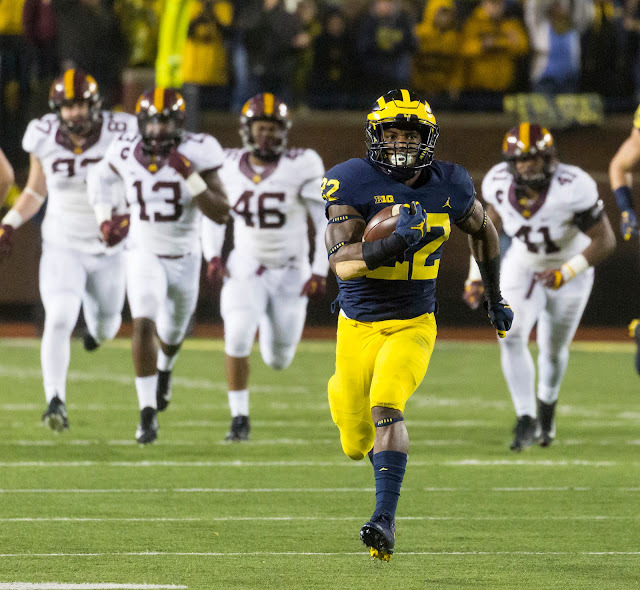 There's no question Higdon is the primary back for 2018. Even though he split carries with Chris Evans and Ty Isaac last year, this offseason Karan Higdon has separated himself from the pack, adding about 15 pounds of much needed weight. As a senior and returning starter, he's primed to be one of the leaders of the offense...he accompanied Jim Harbaugh to Big Ten media days this year along with Tyree Kinnel and Chase Winovich. With Higdon leading the way and Evans the likely backup...the race for 3rd is down to Omaury Samuels, Kareem Walker, and a host of young talent looking for as playing time. You'd like to see someone step up because should Higdon go down, Evans is a good backup option, but not the guy you want on every down. Running back and left tackle are the thinnest spots on the Michigan offense. I don't have much to add about the fullback position other than it sounds like Ben Mason is the man according to what others have said about him this offseason where he earned the nickname "Bench Mason" who is widely considered one of the strongest guys on the team. Michigan will miss Khalid "Hammering Panda" Hill in short yardage situations down on the goal line. But between Mason and incoming freshman Ben Vansumeren, expect the fullback spot to continue to develop and shine in the Harbaugh offense. 2017 was a bad year for Michigan receiver corps. Not only were they vastly inexperienced, but injuries to Tarik Black in the Air Force game and Nico Collins against Minnesota (plus all of the QB woes) truly hampered Michigan's offense. After Kekoa Crawford's 43-yard touchdown catch against Cincinnati on the opening drive of Michigan's second game, all other touchdown passes (which were rare) that season were caught by tight ends. Thankfully Tarik Black is recovered from his broken foot and according to reports has been very impressive in offseason workouts and spring practice. He was Michigan's leading WR when he went down last year. With Tarik back, that will only help sophomore Donovan Peoples-Jones who was thrust into Michigan's primary WR role which he wasn't quite ready for. Expect big tings from these two this season. At the time of posting this, Kekoa Crawford is still on the team, although we do expect him to transfer before fall camp begins this Friday. In the slot, Michigan brings back Grant Perry and Eddie McDoom who have both shown ability to be meaningful contributors. I would love to see McDoom used for something other than reverse sweeps. He's got talent and speed and with a guy like Patterson in at QB, I could see the slot become a much larger part of the offense. Tight ends are a crucial part of the Harbaugh offense. He loves tight ends. Michigan is flush with tight end talent and leading the way is junior Zach Gentry who was second in receiving on the team last year with 303 yards (Perry was 1st with 307). Sophomore Sean McKeon led the team in touchdown catches with 3. Those are surely the top two going into 2018. Tyrone Wheatley Jr was held out of spring with a foot injury but there was plenty of good things being said about Nick Eubanks.